Scenery, lights, sounds, costumes; theatre design is devising storytelling beyond the dialogue. On Monday, May 3, 2010, Chicago gathered at the Goodman Theatre to celebrate the role that designers play in the theatre community. The festivities brought together veteran and rookies in the theatre design world for networking and fellowship. The focal point of the evening was the 17th Annual Merritt Award for Excellence in Design and Collaboration. The award honors the memory of Michael Merritt. Best known for collaborative work with David Mamet, Merritt was a Chicago theatre designer who died at the age of 47 in 1992. The Michael Merritt Endowment Fund preserves Merritt’s legacy with awards acknowledging established designers, nurturing emerging designers and encouraging design students. 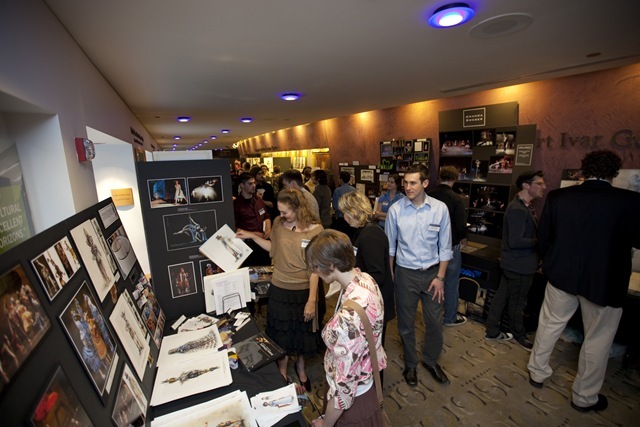 The evening started with the 4th Annual Theatre Design Expo. 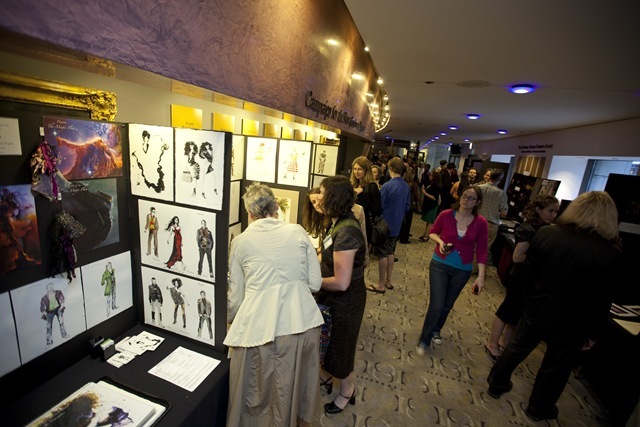 Design students from across the country, along with a handful of Chicago designers, set up displays in the Goodman foyer to showcase their theatre portfolio and aspirations. After viewing the colorful and imaginative exhibits, guests trooped into the Owen Theatre for the Dialogue with the Designers panel discussion. Moderated by the Goodman’s Artistic Director Robert Falls, the group discussed the challenges and accomplishments of collaborative efforts in theatre. 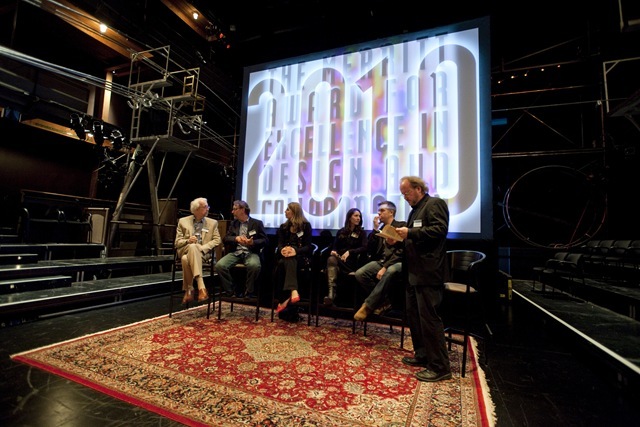 The panelists were Michael Bodeen (composer, sound design), 1997 Merritt Award winner John Boesche (projection designer), 2007 Maggio Award and 2004 Merritt Award winner Ana Kuzmanic (costume designer), The House’s Artistic Director Nathan Allen, and tonight’s Merritt honoree Collette Pollard (scenic designer). Following the panel discussion, the awards ceremony commenced. Pollard’s recent design credits include The Illusion (review ★★★) at Court Theatre, Stoop Stories (review ★★★½) at Goodman Theatre and The House on Mango Street at Steppenwolf Theatre. Her next production opens next week at Writers’ Theatre, Streetcar Named Desire. Pollard has also worked with many Chicago companies, including; The House Theatre of Chicago, Timeline Theatre, Northlight Theatre, and About Face Theatre. Pollard earned her Bachelor’s Degree in Fine Arts with honors in scenic design from The Theatre School at DePaul University and her Master’s Degree in Fine Arts from Northwestern University. Currently, she teaches at Columbia College Chicago. The evening climaxed with the Merritt Award for Excellence in Design and Collaboration presented posthumously in honor of the lighting and scenic design work of Michael Philippi. Philippi passed away suddenly on his way to a technical rehearsal for High Holidays at Goodman Theatre on October 27, 2009. His most recent work was enjoyed at Goodman Theatre in productions of Desire Under the Elms, King Lear, Finishing the Picture, A Life in Theatre, Moonlight and Magnolias, and The Goat or, Who is Sylvia? Philippe also worked with many Chicago, national and international companies including: Northlight Theatre, Court Theatre, Chicago Shakespeare Theatre, Guthrie Theatre, Berkley Repertory Theatre, Milwaukee Repertory Theatre, Manhattan Theatre Club, and the Abbey Theatre in Dublin. He was a recipient of Jefferson Awards for Terra Nova and In the Belly of the Beast, both at Wisdom Bridge Theatre, and Hollywood Drama-Logue Awards for Kabuki Medea at Berkley Repertory Theatre and Changes of Heart at Mark Taper Forum. The 2010 awards program and fundraising event was co-hosted by the Michael Merritt Endowment Fund Steering Committee at Columbia College Chicago and Goodman Theatre. Sponsors included Electronic Theatre Controls, Inc., J.R. Clancy Inc., Schuler Shook, Rent Com, Rose Brand and Steppenwolf Theatre.